Western Europeans and Americans tend to trust their militaries much more than other national institutions. Large majorities in eight Western European countries surveyed by Pew Research Center late last year said they trust the military, ranging from 84% in France to 66% in Spain. 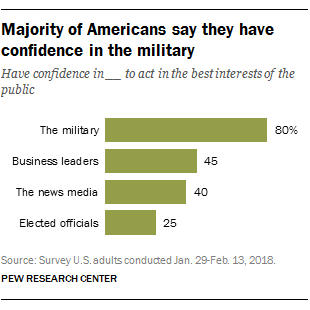 And on a similar survey question asked in the United States earlier this year, 80% of Americans said they have confidence that the military will act in the best interests of the public. Other institutions received far lower marks on both sides of the Atlantic. For example, across the eight European nations polled, a median of only 53% expressed confidence in banks and financial institutions. This trust varied by region: While about half or more in each of the five northern European countries surveyed said they trust banks, only 18% in Spain, 29% in Italy and 39% in France said the same. The U.S. survey did not ask about banks and financial institutions, specifically. But it found that just 45% of American adults had confidence in business leaders to work in the best interests of the public. In both Europe and the U.S., elected officials and the news media received even lower marks than banks and business leaders did. About four-in-ten Europeans said they trust their parliament and the national news media (medians of 43% and 41%, respectively). Northern Europeans again expressed higher levels of confidence in these two institutions: Roughly half or more people in the Netherlands, Sweden, Germany and Denmark said they trust the news media and parliament. Notably, however, British adults reported far lower levels of trust than people in other northern European countries did: Only about a third of British adults said they trust the news media (32%) or the country’s parliament (36%). These levels of trust were more similar to those found in the southern European countries of France, Spain and Italy. Americans’ feelings toward the news media and elected officials were more similar to those in the UK and southern Europe than those in northern Europe. 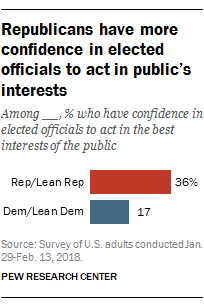 Just four-in-ten Americans said they have confidence in the news media to act in the public’s best interests, and only a quarter of Americans said the same about elected officials. Across the European nations surveyed, trust in parliament was strongly linked to people’s views of their country’s main party in power (or the party that holds the country’s chancellorship, premiership or presidency). Those who viewed their country’s leading party favorably were more likely to place trust in their national parliament as an institution. For example, 81% of Dutch people with favorable views of Prime Minister Mark Rutte’s People’s Party for Freedom and Democracy (VVD) said they trust their parliament, compared with just 53% of people who view the VVD unfavorably. A similar partisan pattern emerged in the U.S. Although the majority of Americans said they don’t have confidence in elected officials, more Republicans and Republican-leaning independents (36%) than Democrats and Democratic leaners (17%) had confidence. This pattern held for other national institutions as well. 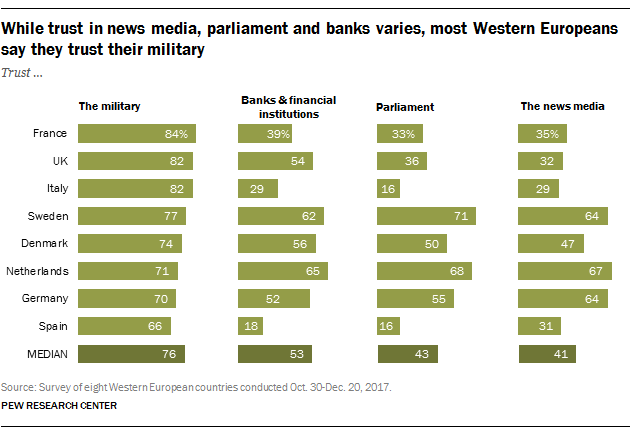 Europeans with favorable views of their countries’ leading party expressed higher levels of trust in the military, the news media and banks and financial institutions. In the U.S., Republicans expressed higher levels of confidence in the military and in business leaders, but not in the news media. Just 16% of Republicans said they have confidence that the media will act in the best interests of the public, compared with 58% of Democrats.